Japan had essentially zero interest rates for 23 years. And..
Inflation stayed quiet and slightly negative the whole time. 23 years of the Friedman rule? Our governments set off what should have been two monetary atomic bombs. Almost nothing happened. This experiment has deep lessons for monetary economics. We learned that inflation can be stable and quiet--the opposite of volatile--in a long-lasting period of immobile interest rates, and with immense reserves that pay market interest. 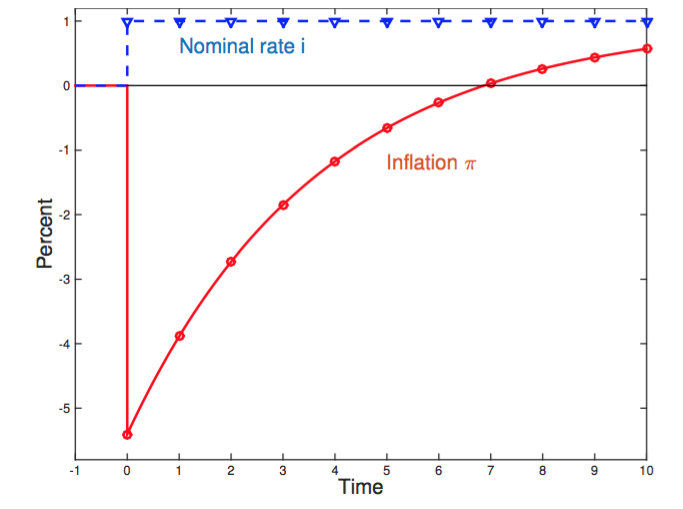 The simplest theoretical interpretation is that inflation is stable under passive policy or even an interest rate peg. Alternative stories--it's really unstable but we had 23 years of bad luck--are really strained. Stability is the central concept in my remarks today, and I emphasize it with the cute picture. If inflation is unstable, a central bank is like a seal balancing a ball on its nose. If inflation is stable, the bank is like Professor Calculus swinging his pendulum. 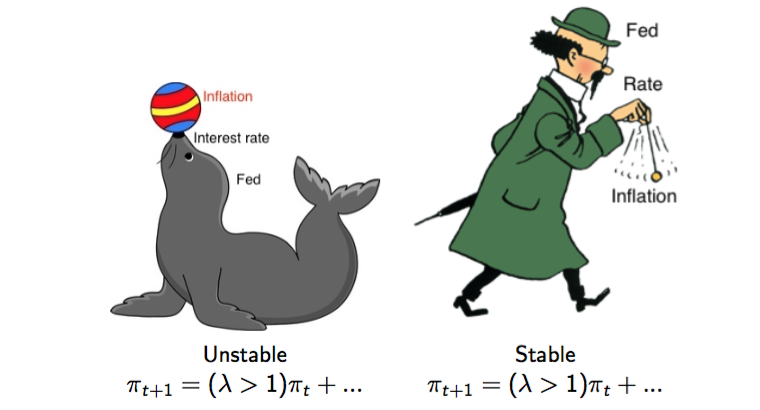 Watching inflation and interest rates in normal times you cannot tell the seal from the Professor. Asking the professor might not help. Tintin fans will remember that the Professor, perhaps like the Fed, thought he was following the pendulum, not the other way around. But if you hold still the seal's nose, or the professor's hand, you find out which is the case. We just ran that experiment. The result: Inflation is stable. Many hallowed doctrines fall by the wayside. We learn that arbitrary quantities of interest-paying reserves do not threaten inflation or deflation. We can live the Friedman-optimal quantity of money. There is no need to control the quantity of reserves. There is no reason for government debt to be artificially illiquid by maturity or denomination. Governments could offer reserve-like debt to all of us, essentially money market accounts. Too bad for contrary hallowed doctrines. The lessons for interest rate policy are even deeper. The equations are not at issue. All models contain these equations, including the last one. The issues are, How we solve, use, and interpret these equations? What is nature of expectations--adaptive, rational, or in between? How do we handle multiple equilibria? And what is the nature of fiscal/monetary coordination? Preview: that last one is the key to solving all the puzzles. The adaptive expectations view, from Friedman 1968 to much of the policy world today, makes a clear prediction: Inflation is unstable, so a deflation spiral breaks out at the lower bound. I simulate such a model in the graph. There is a negative natural rate shock; once the interest rate hits the bound, deflation spirals away. The deflation spiral did not happen. This theory is wrong. The New Keynesian tradition uses rational expectations. Now the model is stable. That is a a big feather in the new-Keynesian cap. 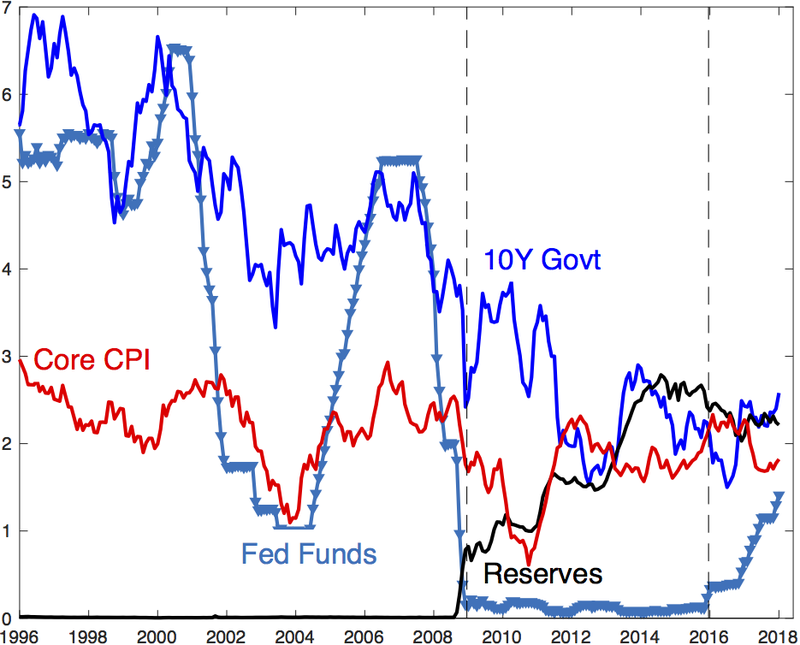 But the new-Keynesian model only ties down expected inflation. Unexpected inflation can be anything. 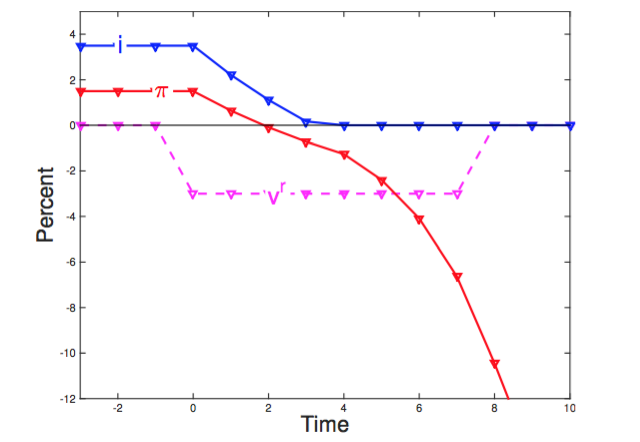 There are multiple stable equilibria, as indicated by the graph from Stephanie's famous JPE paper. This view predicts that the bound--or any passive policy--should feature sunspot volatility. For example, Clarida Galí and Gertler famously claimed that passive policy in the 70s led to inflation volatility, and active policy in the 1980s quieted inflation. A generation of researchers worried that Japan's zero bound, and then our own, must result in a resurgence of volatility. It did not happen. Inflation is also quiet, and thus apparently determinate, at the bound. This theory is wrong--or at least incomplete. Another branch of new-Keynesian thinking selects among the multiple equilibria during the bound by expectations of future active policy. To illustrate, this graph presents inflation in the simple new Keynesian model. 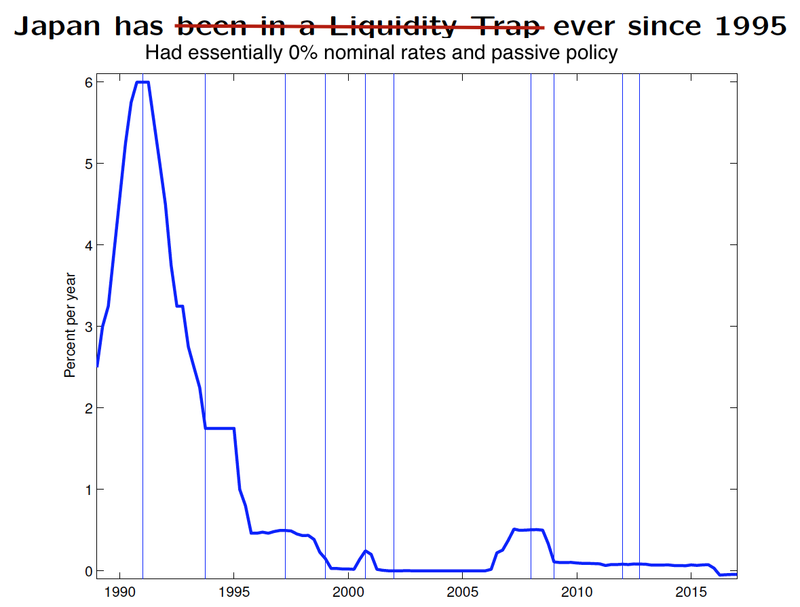 There is a natural rate shock from time 0 to 5, provoking a zero bound during that period. 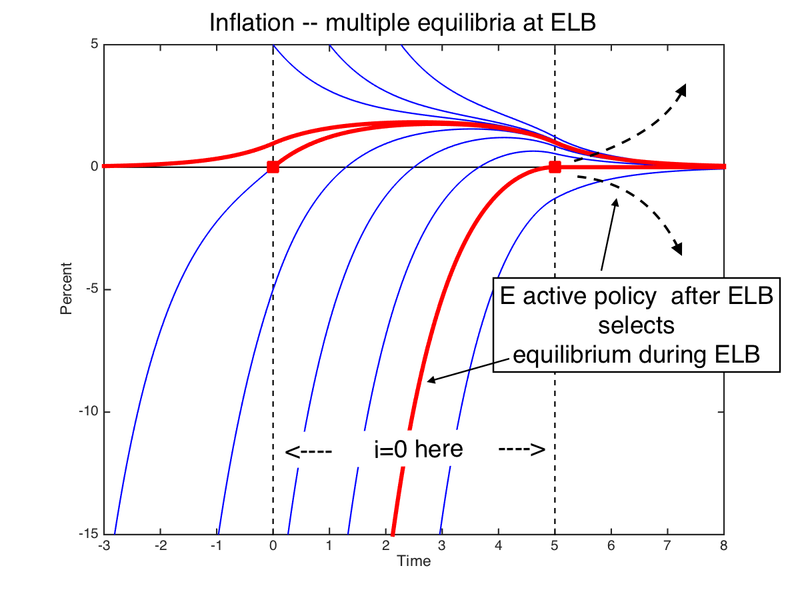 There are multiple stable inflation equilibria. The lower red equilibrium is a common choice, featuring a deep deflation and recession. To choose it, authors assume that after the bound ends, the central bank returns to active policy, threatening to explode the economy for any but its desired inflation target, zero here. Working back, we choose that one equilibrium during the bound. In this view small changes in expectations about future inflation work backwards to large changes at earlier times. Therefore, if the central bank promised inflation somewhat above target at the end of the bound, that promise would work its way back to large stimulus during the bound. 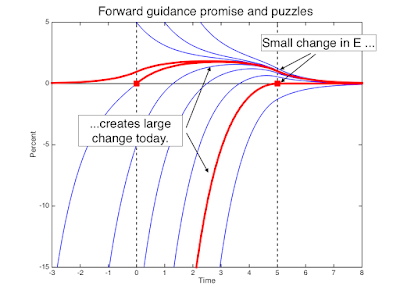 Forward guidance offers strong stimulus. One of Mike's main points today is that a price level target can help to enforce such a commitment. Stephanie's policy of raising rates to raise inflation at the end of the bound can similarly work its way back in time and stimulate during the the bound, perhaps avoiding the bound all together. This selection by future active policy, however, has huge problems. 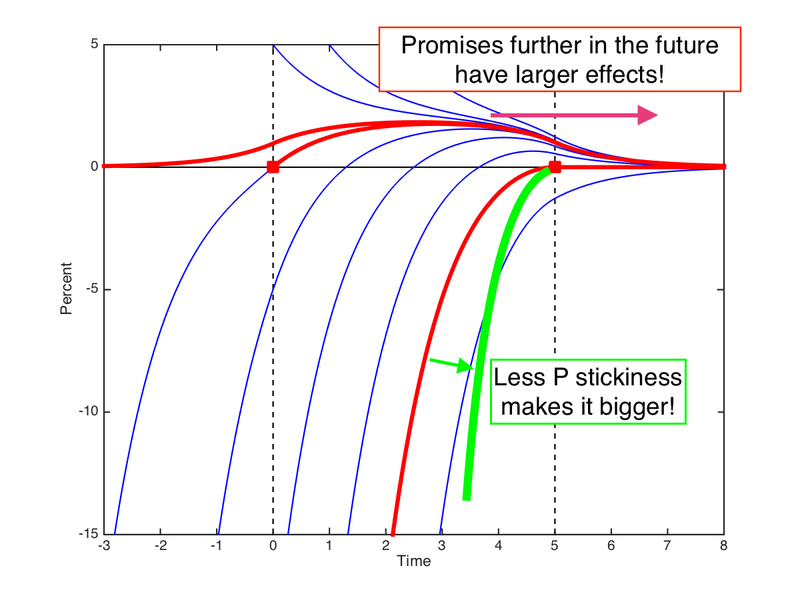 First, promises further in the future have larger effects today! I asked my wife if she would cook dinner if I promised to clean up 5 years from now. It didn't work. Second, as we make prices less sticky, dynamics happen faster. So, though price stickiness is the only friction, making prices less sticky makes deflation and depression worse. The frictionless limit is negative infinity, though the frictionless limit point is small inflation and no recession. 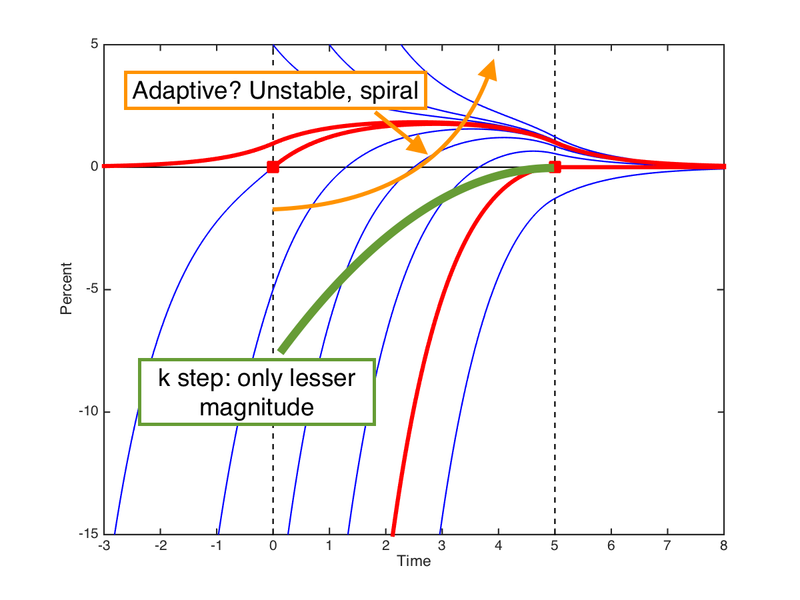 These problems are intrinsic to stability, and thus very robust: stable forward is unstable backward. The new-Keynesian literature is ripping itself apart to fix these paradoxes. Mike, Xavier Gabaix, and others abandon rational expectations. Alas even that step does not fix the problem. Mike offers a k-step induction. It is complex. I spent over a month trying to reproduce a basic example of his method, and I failed. You have to be a lot smarter or more patient than me to use it. Moreover, it only reduces the magnitude of the backward explosion, not its fundamental nature. If we go back to adaptive expectations, as Xavier and others do--after a similar hundred pages of difficult equations--then we're back to stable backward but explosive forward. 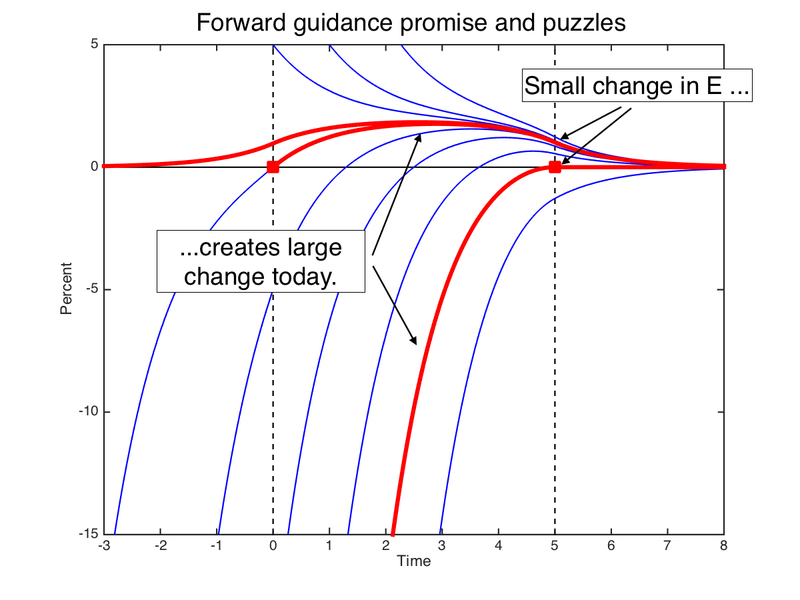 Stable backward solves the forward guidance puzzle--but the lack of a spiral just told us inflation is stable forward. Also, you have to modify the model to the point that eigenvalues change from less to greater than one. It takes a discrete amount of irrationality to do that. So let me unveil the answer. 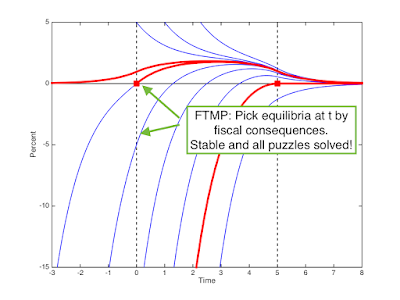 I call it the Fiscal Theory of Monetary Policy. The model is unchanged, but we solve it differently. We remove the assumption that surpluses ``passively'' accommodate any price level. 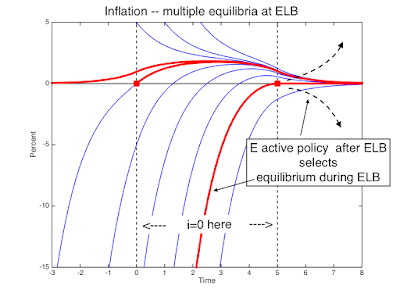 Now, we pick equilibria by unexpected inflation, at the left side of the graph. For example, an unexpected deflation can only happen if the government will raise taxes or cut spending to pay a windfall to bondholders. 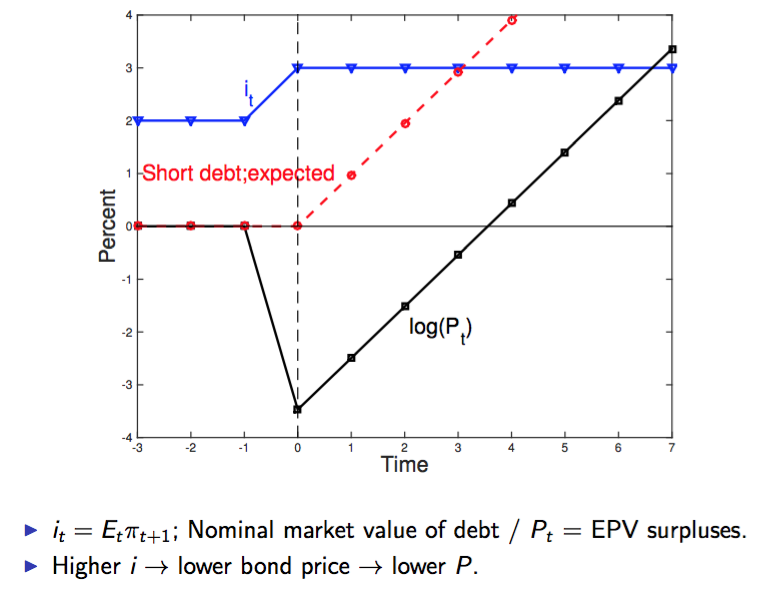 (Or, if discount rates raise the present value of surpluses, which is important empirically.) For example, if there is no fiscal news, we pick the equilibrium with the big red square at zero. This is not some wild new theory. It is just a wealth effect of government bonds. We're replaying Pigou vs. Keynes, with much better equations. 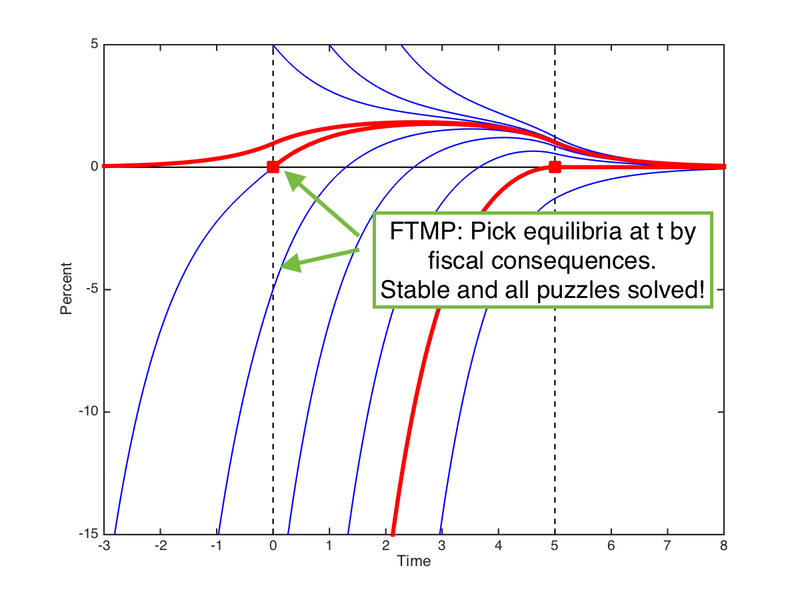 The result is a model that is simple, stable, and solves all the puzzles. 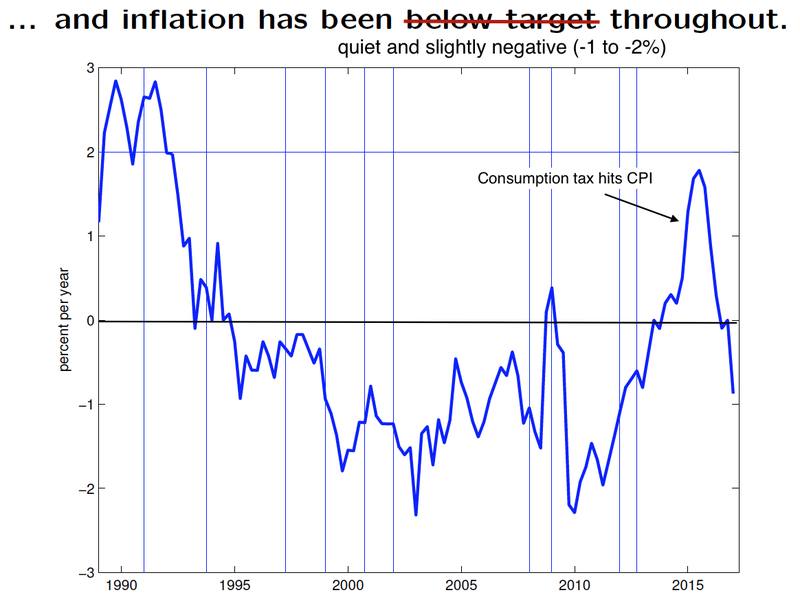 Instantly, we know why the downward deflation jump did not happen. The great recession was not accompanied by a deflationary fiscal tightening! 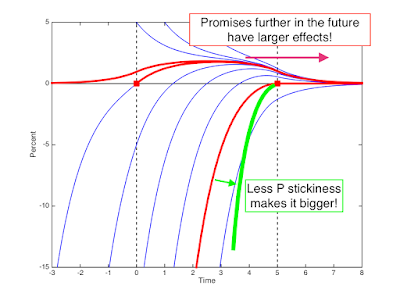 Tying down the left end of the graph, promises further in the future have less effect today and there is a smooth frictionless limit. Tying down the left end of the graph stops backward explosions. You don't have to pick a particular value. The limits are cured if you just bound the size of fiscal surprises, and thus keep the jump on the left hand side from growing. We can maintain rational expectations. This is not a religious commandment. Some irrational expectations are a fine ingredient for matching data and real-world policy; introducing some lags in the Phillips curve for example. But Mike's and others' effort to repair zero bound puzzles by irrational expectations is not such an epicycle. It asserts that the basic properties of monetary policy depend on people never catching on. It implies that all of economics and all of finance must abandon rational expectations even as rough approximations. Just to solve some murky paradoxes of new Keynesian models at the lower bound? For example, Andrei Shleifer, earlier today, argued for irrational expectations. But even he build on the efficient market rational expectation model, suggesting deviations from it. He did not require irrational expectations to begin to talk about asset pricing, or require that all of economics must adopt his form of irrational expectations. I did not think the day would come that I would be defending the basic new-Keynesian program -- construct a model of monetary policy that plays by Lucas rules, or at least is a generalization of a model that does so -- and that Mike Woodford would be trying to tear it down. Yet here we are. Promote the fiscal equation from the footnotes and you can save the rest. Neo-Fisherism is an unavoidable consequence of stability. If inflation is stable at a peg, then raising the interest rate and keeping it there must lead to higher inflation. Conventional wisdom goes the other way. But it is still possible that higher interest rates temporarily lower inflation, accounting for that belief. The standard new-Keyensian model, as illustrated in Harald and Marty's slides seems to achieve a temporary negative sign. 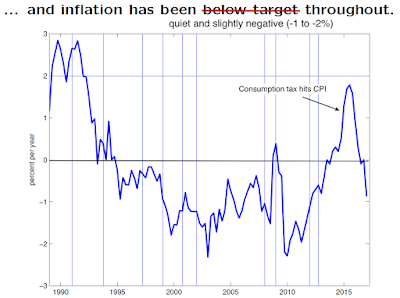 However it only does so by marrying a fiscal contraction ("passively,'' but still there) to the monetary policy shock. It also requires an AR(1) policy disturbance -- beyond the AR(1) there is no connection between the permanence of the shock and the rise or decline of inflation. Can we produce a negative sign from a pure monetary policy shock -- a rise in interest rates that does not coincide with fiscal tightening? The fiscal theory of monetary policy can deliver that temporary negative effect with long term debt. The graph presents the price level, in a completely frictionless economy consisting only of a Fisher equation and the valuation equation. When nominal interest rates rise, the market value of debt on the left declines. (First line below graph.) If surpluses on the right do not change, the price level on the left must also decline. Then, the Fisherian positive effect kicks in. If you add sticky prices, then a rise in interest rates results in a smoothed out disinflation. This is a perfectly reasonable--but long-run Fisherian--response function. In sum, the long-run Fisherian result is an inescapable consequence of stability. The fiscal theory can give a temporary negative sign, but only if the interest rate rise is unexpected, credibly persistent, and there is long-term debt. Those considerations amplify Stephanie's call for gradual and pre-announced interest rate rises to raise inflation. The contrast between the US, that followed Stephanie's advice and is now seeing a rise in inflation, with Japan and Europe, is suggestive. The negative sign in the standard new-Keynesian model comes by assuming a fiscal contraction coincident with the monetary policy shock. Beware! These arguments do not mean that high inflation countries like Brazil, Turkey, and Venezuela can simply lower rates to lower inflation. Everything here flows from fiscal foundations, and absent fiscal foundations and commitment to permanently lower rates, inflation is inevitable. I promised that the ELB was an experiment that would deliver deep implications for monetary policy. Think of the hallowed doctrines that have been overturned in the last 15 minutes. "The New-Keynesian Liquidity Trap'' December 2017 Journal of Monetary Economics 92, 47-63. "Michelson-Morley, Fisher, and Occam: The Radical Implications of Stable Inflation at the Zero Bound" Macroeconomics Annual 2017. "Stepping on a Rake: the Fiscal Theory of Monetary Policy'' January 2018. European Economic Review 101, 354-375. What I've said today, and the graphs, are in these references. 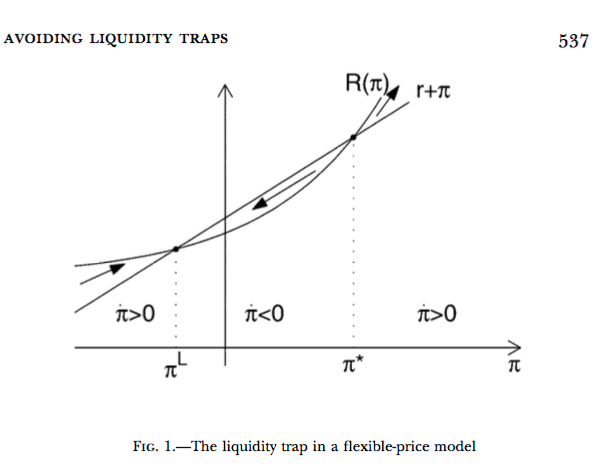 They go on to show you how the fiscal theory of monetary policy provides a simple unified framework for interest rate policy, quantitative easing, and forward guidance, that works even in frictionless models, though price stickiness is useful to produce realistically slow dynamics. See slide 6 of 20. MV not equal to PY? Really? Have you figured out that contrary to Friedman's belief, money velocity is not stable? Reading, half way through stuck on one point. I have the implicit deflator, annual rate, quarterly measured, seasonal adjusted. That line touched or crossed zero three times this cycle. It has otherwise risen, going left in time. That line is ex post pricing, the settled accounts after a revision or two. I get a continual downward trend, or no evidence otherwise. No need for any of the above equations, charts or references to “new Keynsians” whatever they are (I’ve never been able to figure that one out). MMTers worked this all out years ago. 1. The amount of base money the private sector is prepared to hold at a zero rate of interest is limited: i.e. issuing more than that amount will require the state of offer interest on some of that money so as to stop the private sector trying to spend away the latter excess. 2. The latter “hold at a zero rate” amount will pretty obviously change over time, thus the big Japanese debt combined with low interest rates is no surprise at all. It reflects the Japanese desire to save/hoard money. 3. The rate of interest could very easily be raised world-wide if governments world-wide issued much more base money, not that there is any particular reason to do that. Well, for once we disagree. 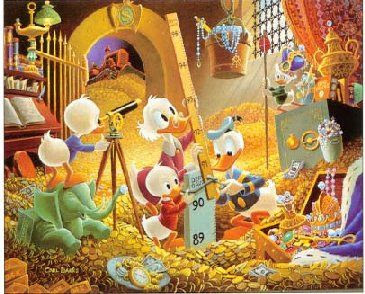 I think the lesson of reserves going from $10 billion to $3,000 billion and inflation not budging is that the private sector will hold any amount of base money if the interest rate is zero. Bonds and reserves are perfect substitutes at zero rates. MMTers do have a few things in common with the FTPL/FTMP, particularly its Chartalist foundations. However, the former jump to conclusions about how one could print money to guarantee full employment without risk of inflation, among other things. My view is that the FTPL/FTMP has foundations that are much more rigorous, even if it appeared quite later, which allow careful policy analysis. I would say that the very short-run risk free interest rate is determined by the convenience yield, which depends on the amount of money. 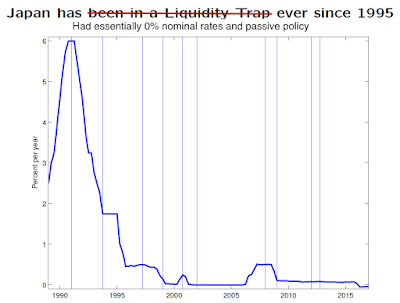 If money is increased beyond liquidity needs then interest rates go to zero (then one can make "money" a.k.a. reserves pay a negative rate, as the ECB did, but that itself has its limitations). At that point, changing the amount of money/reserves by buying government debt does nothing. I do not see how there could be a limit to it, as long as money is being exchanged for government debt of course. If you're just printing money out of thin air, then you have plenty of reasons to worry about "the private sector trying to spend away the latter excess." We learn that arbitrary quantities of interest-paying reserves do threaten inflation or deflation. Is there a "not" missing after "do?" Aha! A very crucial typo, now fixed. Thanks! With global capital markets, global central central banks, and many national budgets...what does this mean? In Europe, is inflation determined in a particular nation by what? The inflation rate in France? I'm still struggling to see what's different here from standard fiscal theory, like in Chapter 17 of Ljungqvist and Sargent. It's some form of stickiness that induces the IS output gap relation? I'm also a little confused by the implications of the last figure. Doesn't it suggest a surprise policy of raising rate would, due to stickiness, have a negative impact on the output gap in the short run. Isn't this exactly what the Keynesians want to avoid in the face of a large external shock? (In the case of the fin. crisis, the external shock was a collapse of private money, aka shadow bank run, which without accommodation is deflationary.) 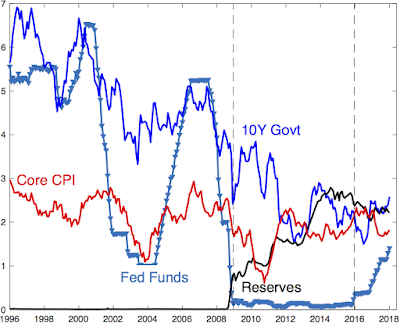 I think all that your model says compared to standard Keynesian story is that at some point the central bank needs to raise rates or it risks making low inflation persistent via the Fisher effect, right? (Kocherlakota made this argument a while back too.) My guess is that turning point happens when the gap is close to closed. But doesn't this just take us back to all the old arguments about the plausibility of sticky prices of sufficient magnitude to generate the sorts of gaps that crude estimates suggest exist? I appreciate the analysis. There was clearly lots of thought put into your presentation. The zero lower bound is something of a rarity, and should be studied further and in more depth. I agree how important forward guidance plays a role in economic stability, and that interest rates are better utilized when expectations are carefully managed. William Bragg, a physicist who lived about a century ago, said "The important thing in science is not so much to obtain new facts as to discover new ways of thinking about them." I like the way this quote summarily binds together the study of economics and where we stand in terms of the current prevailing theories. Just thought this was a nice quote to add to the comments board. Good job, and looking forward to reading more blog entries in the future. where do wages and the quantity of the labor force into play? in the 70's, we saw a massive increase of the working age population, and then in 2000, after the 2-income family became normal, baby-boomers started to retire, and the people replacing them are now accepting lower wages but are more productive due to automation and computerization. what does the stability of inflation have to do with the population of working-age adults?